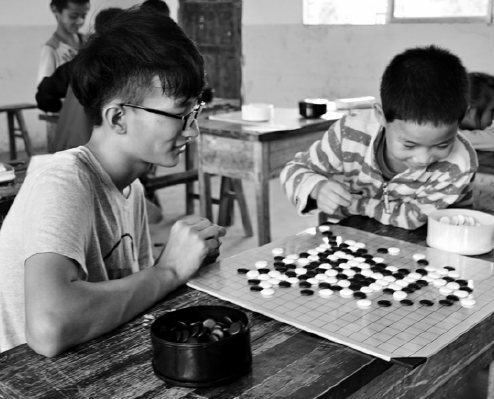 When students from a university in Wuhan signed up to become volunteer teachers in rural Guizhou, many found it to be a life-changing experience, Chen Meiling reports. 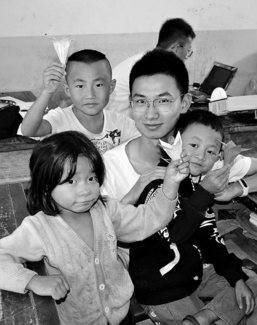 Xu Shiwei, a Chinese college student and volunteer teacher working in the remote mountains of Southwest China's Guizhou province, says he never imagined that real life could be more dramatic than TV when he first met the children "forgotten by God". "My mom left. My dad is in prison," Xie Mengyun, a six-year-old boy, told Xu when they were walking home one day. "Your father is in jail? Did you cry?" Xu asked. "I cried," the boy answered. When they reached Xie's home, Xu saw two other children with their grandmother, who was carrying a heavy basket filled with vegetables on her back, forcing her to stoop under its weight. The grandmother said their parents got divorced early. The mother left the mountain. The father married another woman, who allegedly ended up selling Xie in East China's Shandong province. In 2016, Xie was rescued by police and sent back home. The father was arrested in place of his wife, and won't be released until 2021. 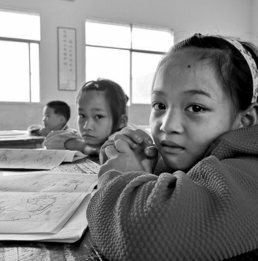 Although diagnosed with diabetes, the grandmother still cares for the children, saying she wanted them to receive an education and grow up to have a happy life. "In this peaceful world, where can little Xie get the love he lacks?" Xu once wrote in his diary. On July 16, a team of 24 college students and two teachers from Huazhong University of Science and Technology in Wuhan, the capital of Central China's Hubei province, set off for Nayong county in Guizhou province, as part of an annual volunteering teaching program set up in 2014. 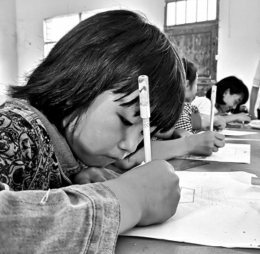 Instead of offering traditional academic courses, they chose instead to teach painting, dancing, handicraft, chess and experimental chemistry classes to 40 children at Zhanghuan Sunshine Primary School, aged from 5 to 13. Many of the children had lost one or both parents. Some had previously dropped out of school, while one suffered from disabilities. The program that lasted through Monday was set up to help local children gain confidence and learn more about the outside world, as well as training college students to have a stronger sense of social responsibility, according to Chen Shutian, a counselor at the university. One of the college students, Zhu Mengqiong, 20, who was born in a rural area and lost her mother at a young age, said she was quite touched by the positive attitudes the children held toward life. "Before I came here, I often felt sorry for myself," she says. "Compared with my classmates who grew up in cities, I didn't have beautiful clothes or money. But the little kids here can make dinner, wash their laundry and do farm work on their own. Their bright eyes and stunning smiles made me realize my life is good enough and will become better in future." Zhu recalls one unforgettable scene when she was teaching children to dance, when a girl with a deformed arm struggled to make a heart gesture using both hands (to show her love and gratitude) along with the music. Besides sad stories like these, the team members also had to endure the extreme conditions in the mountains. Male volunteers had to bathe in the open and sleep on the school desks. They cooked for themselves, using whatever they could find from the limited supply of vegetables and meat available. Most of the time they ate potatoes. "At first I couldn't bear the smell of the shabby restrooms, but soon I got used to it," says freshman Chen Yunxin, 19, adding that she had more than 50 mosquito bites on her legs during her stay there. But despite the hardships, Chen said that after having worked as a volunteer teacher, it made her want to make a lifelong career of it. "Although we just spent several days together, I feel our love for those kids was even stronger than their feelings for us. You cannot just leave without feeling concern for them. I want to see them attend high school and college in the future." 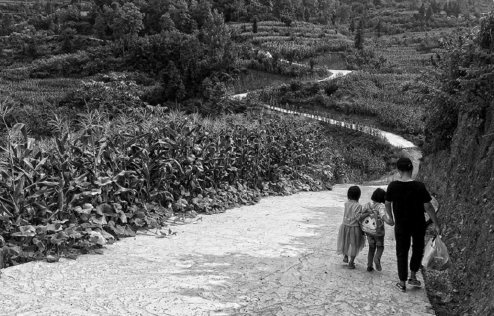 Every evening, the volunteers walked the children back home through the steep and narrow mountain roads. Sometimes they had to send them back two or three times because the children would secretly follow them back to the school again. "When I walked a girl home today, she wouldn't let go of me. She sat down and cried, telling her grandmother that she wanted to go to Wuhan with me to attend school. The scene nearly made me cry," Chen Yunxin says. The university began to donate money and goods to the primary school in 2010. In 2014, they started to send students and teachers there as volunteer teachers for the annual two-week summer camp. This year, they chose the 24 students from more than 50 applicants. They donated over 10,000 yuan ($1,465), including 5,000 yuan from one student, to renovate classrooms, buy basketball, exercise equipment, study tools and dictionaries, Chen Shutian, the counselor, says. Du Rui, 25, a master student set to graduate next year, even gave up an internship to attend the program. 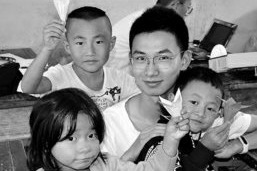 He says through the summer camp, he had gained a better understanding of the urgency of the poverty alleviation strategy put forward by the central government in recent years. "The village now has access to water, electricity and roads, but so much more still needs to be done," he says. "People in poor areas should also enjoy the achievements of reform and opening-up. As college students, our future should be connected with that of the country." Wang Xi, a teacher from the School of Materials Sciences and Engineering at the same university, says many of the college students are too preoccupied by academic pursuits, and have lost sight of their ideals. "Many of them think that only high salaries can reflect their worth as people from such an educated background," she says. "That's why we bring them to the rural areas, to inspire them to think more about the outside world instead of individual gain, and to learn the meaning of making a contribution to the country." Chen Lin, a doctoral student, says many of her classmates who had attended the program have kept in touch with the children by mobile phone or mail.